Denny Jump (Bellevue, WA, United States) on 27 August 2018 in Architecture. Here on the Washington State Capital Grounds, a great amount of concern and care was taken to "get Things Right." with regard to Memorials....These things did not always "happen right" the first time...In some cases, corrections/modifications/replacements had to be done. But "those who have served" are recognized. As a veteran I am very appreciative of the consideration that was shown. 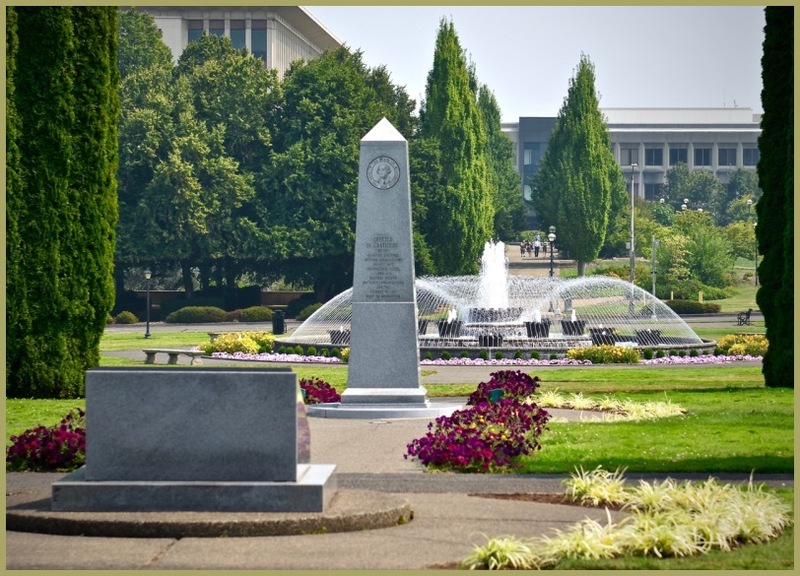 The first item shown in the lower left-hand corner of this image is the POW/MIA Memorial saluting Washington State Military who have been identified as Missing in Action or Prisoner of War. Further off into the distance is the gorgeous Tivoli Fountain. - I will have a feature piece on that fountain in my next Post in a few days. It is beautifully done, Denny. An excellent composition which incorporates eye-catching elements from different depths and angles!! A beautiful image, Denny. The fountain was dormant for years awaiting repairs. They finally got it going again not too long ago. @Steve Rice: Thank you Steve! Yes, I have some literature regarding the fountain....can't wait to read it ;-) We were busy the last few weeks with our Son and his wife and our two grand daughters all visiting from Vallejo ;-) Cheers sir! Lovely composition and perspective Dennis. Great line of sight from the first memorial stone all the way to the people and buildings in far distance. You got things right in composing this photo. Well done. A beautifully focused lovely composition.